- EROS I - (11 Days/10 Nights) - 3 Nights Athens, 3 Nights Mykonos & 5 Day Cruise. 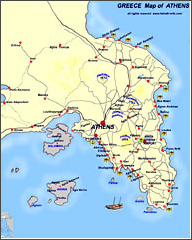 Athens, Mykonos, Kusadasi, Patmos, Rhodes, Heraklion, Santorini. 2 Days at leisure to explore the “jewel” of the Aegean Sea. Early evening transfer to the port to embark on the ship, sailing at 11:00pm, for a 5 Day cruise. Today we visit Rhodes, (7:00am – 6:00pm). Arrive at the port at 7:00am. Disembark, transfer, (on your own, to the Hotel.